Choose an old fashioned ice cream cone recipe and learn how to make your own waffle cones. Enjoy the extra-delicious taste of a homemade cone anytime. 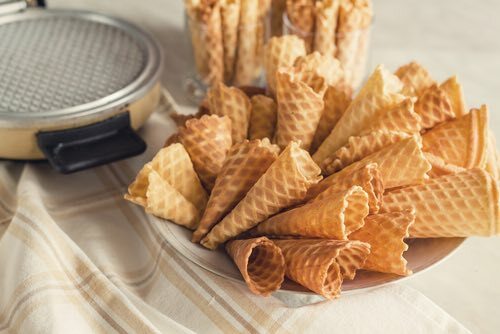 The crispy wafer cones will melt in your mouth and are perfect for serving your favorite homemade ice creams. An inverted cake pan can be substituted for the old fashioned dripping pan called for in the following wafer recipes. Or, you use an electric waffle maker. 1/4 cup butter, 1/2 cup powdered sugar, 1/4 cup milk, 7/8 cup flour, 1/2 teaspoon vanilla. Cream the butter, add sugar gradually, and milk drop by drop; then add flour and flavoring. Spread very thinly, with a broad, long-bladed knife on a buttered, inverted dripping pan. Crease in three-inch squares (or 5-inch squares if rolled cornucopia shape for use as larger ice cream cones), and bake in a slow oven until delicately browned. Place pan on back of range, cut squares apart with a sharp knife, and roll while warm in tubular or cornucopia shape. If squares become too brittle to roll, place in oven to soften. If rolled tubular shape, tie in bunches with narrow ribbon. These are very attractive, and may be served with sherbet, ice cream, or chocolate. If rolled cornucopia shape (cone shape), they may be filled with whipped cream or ice cream just before sending to table. Rolled colored wafers may be made from this mixture by adding leaf green or fruit red coloring. If colored green, flavor with one-fourth teaspoon almond and three-fourths teaspoon vanilla. If colored pink, flavor with rose water. Colored wafers must be baked in a "very slow" oven to prevent browning. Before baking Rolled Wafers, sprinkle with almonds blanched and chopped. Four ounces of sugar, four ounces of butter, eight ounces of flour, the yolk or white of one egg, and half a teacupful of milk or water. Melt the butter in the water; mix the egg, sugar and flour together, adding, by degrees, the melted butter and water; or, instead of the butter, it may be made into a thin batter with cream, and a little orange-flower water, or any other essence, to flavour it. The mixture may be coloured. Make the wafer tongs hot over the hole of a stove or clear fire. Rub the inside surfaces with butter or oil, put in a spoonful of the batter, and close the tongs immediately; put them on the fire, turning them occasionally until the wafer is done, which a little practice will soon enable you to ascertain; roll the wafers on a small round stick, stand them on their ends in a sieve, and put them in the stove to dry; serve them filled with ices. Note that this old fashioned wafer recipe published in 1913 was closely adapted from Eleanor Parkinson's earlier recipe (above) published in 1864. The two recipes are nearly identical. Dissolve four ounces of butter in half a teacup of milk; stir together four ounces of white sugar, eight ounces of sifted flour and the yolk of one egg, adding gradually the butter and milk, a tablespoonful of orange-flour water and a pinch of salt; mix it well. Heat the wafer irons, butter their inner surfaces, put in a tablespoonful of the batter and close the irons immediately; put the irons over the fire, and turn them occasionally, until the wafer is cooked; when the wafers are all cooked roll them on a small round stick, stand them upon a sieve and dry them; serve with ices. Consider this an old fashioned ice cream cone recipe, as the cialdoni can be adapted to make tiny cones simply by rolling the hot wafers into small cone shapes to contain the ice cream. Put in a kettle: flour, three ounces; brown sugar, one ounce; lard virgin, half an ounce; cold water, seven tablespoonfuls. First, dilute the flour and the sugar in the water, then add the lard. Put on the fire the iron for waffles, or better an appropriated iron for flattened wafers. When it is quite hot open it and place each time half a tablespoonful of the paste. Close the iron and press well. Pass over the fire on both sides, trim all around with a knife and open the iron when you see that the wafer is browned. Then detach it from one side of the iron and — hot as it is — roll it on the iron itself or on a napkin using a little stick. This operation must be made with great rapidity because if the wafer gets cold, it cannot be rolled. Should the wafers remain attached to the iron, grease it from time to time, and if they are not firm enough, add a little flour. Ice cream cones as we know them today were first seen in North America at the St. Louis World's Fair in 1904. They proved an instant hit with the public, and the demand for the "World's Fair Cornucopia" soon spread worldwide, ensuring their place in ice cream cone history. 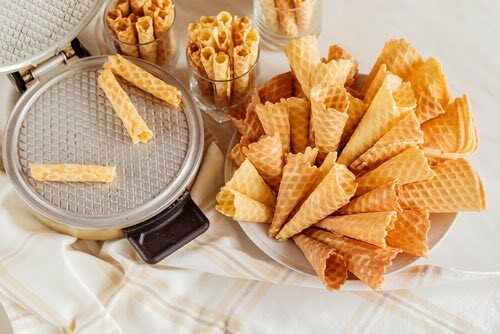 The hot waffle-like wafers made from the above recipes may be rolled onto cone-shaped forms for use with ice creams, or pressed into muffin tins to make edible dessert cups for ice creams or puddings. Cone-shaped forms to roll the hot wafers on can be easily made of stiff cardboard that is then covered with heavy aluminum foil to prevent the wafers from sticking. Choose a traditional ice cream cone recipe and make some homemade waffle cones today. You'll be amazed at how good they taste with your homemade ices.